If there is one thing I cannot stand it is how quickly my Windows computers pile up with garbage files that eat away at computer performance. In fact, I dare say I am a bit of a fanatic about how fast my computer runs – it must be speedy!! As a result, I have wound my way through a number of crappy programs over the years to find these few nuggets that really save me from pulling out my remaining hair. I expect over time this list will grow but here are a few tried and true programs I have used. I feel it is important to note that here and there I have used affiliate links when linking to programs I recommend. This does not take away from the fact that I do 100% recommend each program; I simply figure I needed to link to the products anyway so why not make a dollar or two? I am very sad to say that my research into the 3rd party plugins I could use within ACDSee Pro 3.0 (their latest, top of the line product – which I like) turned up very very bad news. Absolute Color Picker is a huge time saver for anyone who occasionally needs to alter the hexadecimal color of a style on a stylesheet or on a web page; at least for those not nerdy enough to have memorized them 😉 Until I found this application I had to open Dreamweaver or Adobe Fireworks to pick a color. Absolute Color Picker is incredibly fast to download, takes virtually no space on your hard drive and runs quickly. An even cooler benefit… you can select a color anywhere on your desktop to get the hex of the color as well as other useful stats. Select colors and grab them! Select any color you like from any of the tabs available. Every tab emphasizes a certain aspect of a color selection. 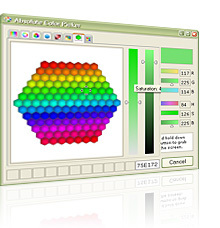 You can choose any color by relying on hues combination, color palettes or color saturation/brightness availability. Convert colors into hexadecimal code. Color Picker will immediately convert any color you choose into HTML-based hexadecimal representation. With Color Picker you will be able to not only generate any color scheme you like, but also manage default color schemes and the ones you have created yourself. Moreover, Color Picker has a very useful Eye Dropper feature. If you click the eye-dropper and while holding down the mouse button move cursor to any point of the screen, you will get the color of this point. Check out the Absolute Color Picker – its 100% free. Note that I am totally unconnected with it. I do not get paid for this, and I am not an affiliate. This is just me raving about a cool product that has definitely saved me time and money!